*Daily Instant Win* | Rrroll Up Roulette Is Back! Along with all the great prizes that you could win with Tim Hortons Rrroll Up The Rim you can also play Rockin Rrroll up Roulette online for even more chances to win great prizes. Click here to play Rrroll Up Roulette! Be sure to let us know if you win anything! Here is what you can win when you play Rrroll Up Roulette. 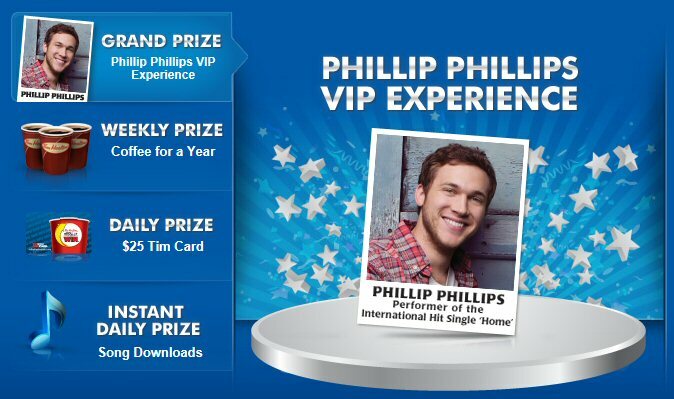 Instant Daily Prizes – Song Downloads, Daily Prizes -$25.00 Tim Card, Weekly Prize – Coffee for a Year, and the Grand prize is a Philip Philips VIP Experience which includes 2 Phillip Phillips concert tickets, Backstage meet & greet with Phillip Phillips, and a private sound check party with Phillip Phillips!.